Polycarbonate Composites Market outlook « Global Market Insights, Inc. The global polycarbonate composites market is slated to emerge as one of the most lucrative investment avenues over the forthcoming years, given the product’s deployment in numerous industrial sectors. An unfilled polycarbonate is an extremely durable and transparent engineering plastic with its properties ranging from immense impact strength to a significant modulus of elasticity. Moreover, the material is also extremely resistant to moisture, possesses a high heat-deflection temperature and high voltage & low frequency insulating characteristics, making them ideal to be used for making electrical & electronic components. Meanwhile, its transparency, elasticity & high impact resistance also make it a prime material for numerous transparent structural applications. These properties ensure a sustained & significant demand for the material from several industrial domains, which would be responsible for fueling the polycarbonate composites market share in the coming years. Polycarbonates are also highly versatile, in the sense that they can be mixed with other materials to accentuate certain properties. For instance, polycarbonates mixed with varying amounts of glass fibers results in a material that has an increased level of tensile & compressive strength as well as overall stiffness. These hybrid composites could be used anywhere between to make race car or fighter jet windshields. This versatility opens up a plethora of application avenues for the product, thereby fueling polycarbonate composites industry trends. It is a well-known fact that the level of fuel consumption in an automobile is directly linked to its weight. Higher the weight, higher the energy required to get the vehicle moving. In an effort to make vehicles more energy efficient, car designers across the world, while constantly seeking new ways to further enhance their vehicle’s fuel efficiency, place a significant amount of emphasis on eliminating this weight while keeping the vehicle’s structural integrity intact. This requirement has steered the global automotive industry to turn to polycarbonates as an extremely viable alternative for glass & metal. Significantly lighter, yet just as strong, polycarbonates today play a crucial role in the automotive industry by improving fuel economy & reducing carbon emissions. Moreover, the lighter a vehicle gets the easier & quicker it can brake, which during an imminent collision leads to a significantly reduced collision impact. This promotes a safer & better driving experience, further positioning the polycarbonate composites demand graph in an exponential position in the automotive industry. According to the European Polycarbonate Sheet Extruders, a typical automobile body incorporates over 10Kg of polycarbonates in numerous forms, with injection molded polycarbonate making up the displaced glass & headlights, an ABS & PBT polymers’ blend used for under-the-bonnet components & vehicle interiors and PC/ABS polycarbonate blend facilitating advantages in scratch resistance, vehicle aesthetics & dimensional stability. These applications are further going to grow with improving economic conditions globally, ensuring a rise in automobile sales. 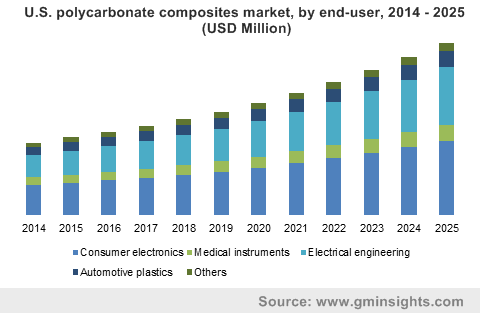 As a matter of fact, polycarbonate composites market share from automotive plastics is projected to grow at a 6% CAGR over 2019-2025. According to the International Monetary Fund, the immense global smartphone demand has been the primary factor behind the generation of a new tech cycle around the globe. In fact, back in 2016, smartphone sales across the world reached the 1.5 billion unit mark – around one smartphone for every fifth individual in the world. This trend has engendered evolving & complex supply chains throughout the globe, especially Asia. The polycarbonate composites market has been estimated to be one such industry that is witnessing significant demands from the rising smartphone sales. While, some smartphone manufacturers prefer to make the bodies of their smartphones completely out of metal or glass, a majority of them tend to lead more towards the lightweight yet durable plastics made out of polycarbonate composites. One factor that puts forth a strong case towards the use of polycarbonate is the issue of network reception; as metals & some formulations of glass constantly interfere with the mobile device’s internal antenna, leading to frequent signal & call problems. This issue is virtually nonexistent inside handsets made out of polycarbonate exteriors. According to the GSMA Intelligence, the total number of unique mobile users surpassed the 5 billion mark back in 2017. The mobile industry across the world is projected to accomplish a further milestone by 2025, wherein the unique mobile user numbers would be reaching the 5.9 billion mark, which is equivalent to approximately 71% of the world’s population. This growth is expected to maintain a healthy demand for polycarbonate composites, further fueling the overall growth of the polycarbonate composites market from consumer electronics applications. Owing to the massive product demand from some of the most expansive industry verticals, it is quite clear, that the global polycarbonate composites market would be experiencing significant growth prospects over the forthcoming tears. In fact, according to Global Market Insights, Inc., the overall polycarbonate composites market size is projected to surpass the $3.2 billion renumeration mark by 2025. This entry was posted in Polymers and Advanced Materials and tagged APAC Polycarbonate Composites Market, Canada Polycarbonate Composites Market, Europe Polycarbonate Composites Market, Germany Polycarbonate Composites Market, Polycarbonate Composites Industry, Polycarbonate Composites Industry Analysis, Polycarbonate Composites Market, Polycarbonate Composites Market 2019, Polycarbonate Composites Market 2025, Polycarbonate Composites Market forecast, Polycarbonate Composites Market growth, Polycarbonate Composites Market outlook, Polycarbonate Composites Market PDF, Polycarbonate Composites Market report, Polycarbonate Composites Market share, Polycarbonate Composites Market size, Polycarbonate Composites Market statistics, Polycarbonate Composites Market trends, U.S. Polycarbonate Composites Market.